I must have been three or four years old. I remember going on a train underground, but I don’t remember who I was with. All I remember was that the wagon I was travelling in was making loud noises on the rails as it chugged uphill in the dark; and then it suddenly resurfaced. Years later, I was visiting the Epcot Center in Disney World with my wife and then two young daughters. We were in the sphere of the Spaceship Earth climbing uphill in a cart in the dark when at once I had that childhood flashback. We were climbing uphill shuddering in the dark, not knowing where we were going, nor what we're going to face next. My middle and high school years between 1958 and 1965 were spent in a boarding school, Sankt Georg Austrian College in the Karakoy District of Istanbul, right by the Galata Bridge. The school is located approximately at one third of the distance on the hill connecting Karakoy to Istiklal Caddesi (Rue de Pera). In those years the road called Tersane Caddesi running parallel to the Golden Horn had several stores that sold shoes, handbags, and leather goods on both sides of the street. The displays often included expensive and stylish men and women’s shoes from Italy. Right at the beginning of the street was the building of Banco di Roma, another trademark of the area where once the Genoise population and trade was intensified. 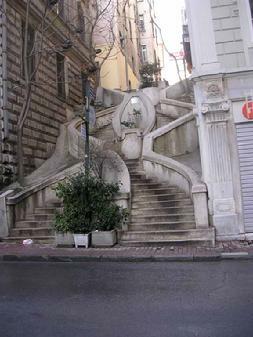 We used to hike up the hill near the “Tunnel”, cross the Bankalar Caddesi (Street) and use the”Kamondo” stairs to arrive at the Avusturya Lisesi on the Kartcinar street.The Kamondo stairs were built by a local, wealthy Jewish family.The stairs connected two streets on different levels, the steps were patterned in a figure eight with flower beds in between. Where the two circles of the figure eight met ,there was a leveled resting area. At the start and close of each school day, there was a beggar in this leveled platform. His two legs were amputated below the knee and covered with leather kneepads. He made his living by begging from the students going to and from school and from visitors to the nearby hospital. We only used the Tunel on weekends when we wanted to go to the Istiklal Caddesi in Beyoglu(Pera) ;or in the later high school years, after we were leaving Cicekpasaji, a nightclub/bar district on Istiklal Street, and then returning to Karakoy to catch the ferry home . Uphill from the Tunnel, there used to be the Hachette book store which always carried books and magazines in English, French or German books and magazines.Parallel and above the tunnel ran the the Yuksek Kaldirim, which is a narrow street connecting the Karakoy district at the bottom of the hill to the Pera at the top of the hill. The Yuksek Kaldirim derives it’s name from high sidewalks which are actually like very wide steps which are necessary due to the steep hill. As one started going down hill from Hachette bookstore, down the stairs in Yuksekkaldirim, one would first notice stores on both sides of the street selling musical instruments, then a line of stores selling rare stamps for stamp collectors, and once arriving at the level area by the Galata Tower, one could delight in finding a pickle store, a bakery which always sold Paskalya Coregi, (Easter muffin), small churches, and mosques; and just a little further down the road one could hear the music from the record stores...Always a bustle. Atop the hill, at the Tunel’s arrival station, there was always this mystic smell, the smell of moisture and blue and green ceramics on the walls. Down the hill ,in the other station by Karakoy, I recall during hot summers a cool breeze hitting my face as I entered the tunel. In this station there used to be a big iron pulley, three or four meters in diameter resembling a wheel. Inside the wheel there were belts made of thick leather or iron chains ,which I don’t remember exactly, pulling the two wagons one in the upper and the other in the lower station with the help of a crank. When the Tunel first opened the whole system was operated by steam power; and later on when I was a high school student it had changed to electrical power. Since the civilized history of the United States is not that old, nostalgic and treasured objects remain carefully preserved. I was in San Fransisco years ago when I realized that it’s hills, harbour,Golden Gate Bridge, ocean views, and cable cars were very familiar and it felt like home. On Lombart Street there is a destination station of the cable cars .When I saw this station for the first time, unconsciously it had reminded me of the Tunnel in Istanbul. There was a hill as steep as Yuksek Kaldirim and at the lowest point of the hill was the arrival station. The wooden wagons coming down the hill disembark their passengers.The wagon which just came down on the rails sat on top of a huge wheel. Two conductors start turning the wagon on top of the wheel 180 degrees until the front of the wagon is lined up to the hill. New passengers board the wagon for the trip going up the hill. 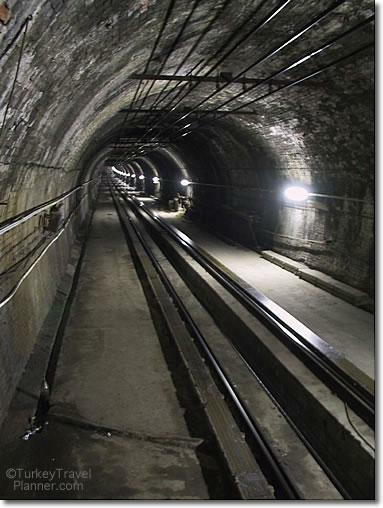 The only difference between the cable cars of San Francisco and the wagons of the Tunel in Istanbul was that the cable cars were riding in the open air instead of underground. Tunel had a very distinct moisture aroma, especially in the upper station. There are some unforgettable smells from the far reaches of childhood, reminders of when we had first smelled that particular scent. I remember the smell at the Haydarpasa train station in Istanbul, the snuff of coal particles in the air, the smell of the coal used in the steam train which burned one’s nasal passages. The air under the old Galata Bridge was filled with ocean, sea weed, smoke, and fish smells. These nostalgic aromas are countless in my mind. The whiff in the air of the Galatasaray Hamami (Turkish bath) near Istiklal Caddesi, is of soap, steam, foam, and clean peshtemals. But somehow I have always remembered most poignantly the aroma of the Tunel. The station on the lower level of the Tunel compared to the other one is unpretentious, hidden in a corner, and easy to be missed by someone who is unfamiliar with the area. At first, we used to buy the tickets made of cardboards from the ticket booth and then walk down the tiled gateway to wait for the wagons with the varnished wooden doors to arrive. Later in the 1960’s the turnstile and token system was introduced. And nowadays the Akbil or the smart card, is used in all public transportation systems including ferryboats, motorboats, buses, metros, trains and the Tunel. The train trip in the tunel used to take three minutes at the most. After the station conductor, in his navy blue uniforms gave the O.K. sign, passengers would start entering the wagon from the same door as few others were still getting off.The seats were wooden, but they were covered with leather cushions.Some of the wooden seats were flexible- backward and forward- and some in the middle of the wagon were facing sideways. The metal pipe running the length of the wagon on the ceiling had many leather grip handles for the passengers to hold on. Soon you would hear a bell sound similar to the one we heard at school, then the blue, green and red glass inlaid wooden doors would shut automatically. Once the machinist, in the front section of the wagon, went inside his glass doored cab he started the engines; and the wagon would start climbing up the hill. 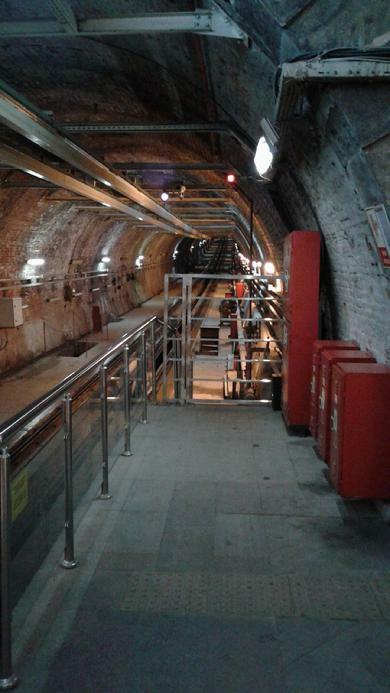 In the middle of the tunnel, probably in the vicinity of the Galata tower under ground, the other wagon coming down would meet the one going up. Like the minute and hour hands of a clock these two machinists would meet and then salute each other; and then under the dim lights of the tunnel travel in opposite directions. Depending on the length of their shifts, this salutation continued every five minutes for several times a day. Of course, the Tunel has a history before my time which I haven’t witnessed nor heard too much about. About a hundred years before I started high school in 1867, a French engineer, Eugene-Henri Gavand, came up with an idea to help people who had to walk the steep hill between Galata and Pera every day to go to work. Even then the number of people making this trip every single day was estimated to be in tens of thousands. Gavand talked to Sultan Abdulaziz about an idea to open a tunnel and to lift the people up and down the hill of Yuksekkaldirim. After several tries he convinced the Ottoman Sultan and was granted the permit to build a tunnel.In those days of course they did not have any machinery compared to today; and the construction of the Tunel lasted five years. As the saying goes” it was like digging a well by using a spoon.” They rented several mules from an Iranian owner who had used them for smuggling goods at the border or for carrying coal in coal mines. These longsufferıng animals who navigate well helped to carry thousands of tons of dirt to Tepebasi ,up the hill from Kasimpasa, at the Golden Horn where the famous Pera Palace Hotel is situated. Even today, if one looks carefully from the Tepebasi area down to Kasimpasa he will realize that where he stands. The area was flattened and a plateau was created at one time. In 1874 construction of the Tunel was finally completed and the first passengers were yes, animals like sheep and chicken.The train powered by steam and lit by gas lamps carried the animals safe and sound to the Cadde-i Kebir* (The big Road) in Pera. It is not known, who took offence from the functioning of the Tunel, but some people influenced the Seyhulislam, who was the highest religious authority in the country and the religious advisor to the Ottoman sultan to write a fatwa saying: “that whoever travels in the tunnel and whoever operates the wagons will commit a sin and make an illicit gain.”With this religious decree the official opening of the Tunel came to a halt. After a long struggle, the Seyhulislam was convinced again to write a second fatwa allowing the travel in the tunnel to be legal. On January 17, 1875 the first passengers crowded the wagon, paid 10 para(cents), and made the trip up to Pera. Istanbul’s Tunnel(Tunel) is the world’s shortest and third-oldest passenger terminal, after the underground systems of London and New York. If you haven't ever used the Tunel before make sure the next time you are in Istanbul to make this historic trip underground. Of course, the wagons now are made of metal and painted red, are faster, and the signs saying “Sigara icilmemesi rica olunur” are replaced by “No Smoking” signs, but the aroma in the upper station remains the same.